I’m rapidly coming to the conclusion that the parking system in Walsall, and it’s enforcement, is a scam directed at easy targets for maximum profit. Chuckery resident TraceyQ, a well respected, community spirited, long time friend of this blog, who works in Brownhills High Street, recently had the misfortune to find her car ticketed on Sunday Morning. Anyone who knows the Chuckery area will know how bad parking is there – rows of terrace houses, densely packed together with no driveways to speak of. Naturally, there are parking conflicts. However, Tracey’s experience, like that in several other residential areas of Walsall, seems to be that parking enforcement wardens are targeting these ares specifically because they’re easy pickings. Photo taken by Tracey later the same day. These are the lines she was half parked across, right outside her house. The car in the distance is regularly parked, as it was that morning, obstructing the junction, yet never receives the same attention. Tracey has sent the following email to her councillor, and asked if I’d publicise her plight here on the blog. I’ve edited out some of the personal details for reasons of privacy. I live at the top of … Street, Chuckery and the new, extended double yellow lines come down to about halfway across my property on either side of the road. When I returned from work on Saturday night there was nowhere either on Chuckery Road or at the other end of … Street to put my car. Very often this is due to people parking across the junction and minibuses parked on Chuckery Road. 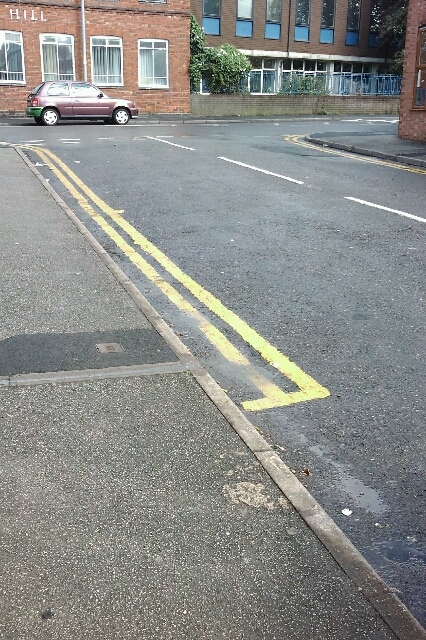 As a result I had to park my car on the end of the double yellows at the top of the street. When I left my home at 11am on Sunday morning to go shopping I had a PCN stuck to my car with a time of 9.30 am on it. Since parking restrictions have been brought in by Walsall council I am seeing at least 1 car per week owned by someone who lives on my street receiving a ticket. (Including my Husband who was ticketed a couple of years ago while unloading gardening tools through the alleyway to the gardens that we had borrowed – I was told if I coud not produce a reciept for the tools the ticket could not be cancelled. As we had borrowed the tools this was not possible!). Very often I am seeing these tickets on cars before 8.30am before residents are leaving their homes for work. This strikes me that we, as residents, are being targeted by the wardens as we do not have a resident’s only permit system operating like other parts of the estate. As the only full time working adult in my house (My Husband is currently a full-time mature student) I can scarce afford the cost of this ticket without sacrificing the funds from my strict weekly budget for a family of 2 adults and 2 teenage boys. I would be very grateful if you can look into this for me and maybe examine the possibilities of bringing in a resident’s parking scheme for the householders in the Lumley Road, Florence and Moncrieffe Streets area. I regularly traverse the roads of Chuckery, Butts, Pleck, Caldmore and Alumwell, and one thing I can guarantee is that where there’s real trouble due to parking infringements – like Caldmore Green, or near any local school at school run time – the enforcement officers are nowhere to be found. Twice a day, week in week out parents engage in dangerous parking near schools utterly unchallenged because otherwise junior might have to walk 50 yards. The local Fitness First Centre in Walsall Wood regularly sees extreme levels of pavement parking that go unchallenged. Yet it’s apparently considered a priority to ticket cars in residential streets at 9:30am on a Sunday. This scene is repeated day after day outside Fitness First in Walsall Wood, yet oddly, these guys never get pulled for it. This is symptomatic of a parking system in Walsall that appears to be solely targeted at maximising revenue rather than providing any useful service to the residents of the town. It’s interesting to note that virtually all the councillors who defend it live in the leafiest suburbs of the borough with nice big, wide driveways. I have every sympathy with Tracey. It’s hard enough to make a living in this place as it is, with a council that’s actively hostile to businesses and residents, without being randomly taxed for 35 pounds a time, apparently on the whim of an enforcement officer with a target to fulfil. Walsall Council’s failure to address it’s abysmal parking enforcement system is costing traders business, residents large sums of money and the authority the good will of it’s citizens. It’s a shambles. This entry was posted in Bad Science, Brownhills stuff, Environment, Events, Express & Star, It makes me mad!, Just plain daft, Local media, Local politics, News, Reader enquiries, Shared media, Social Media, Walsall community, Walsall Council, Walsall Wood stuff and tagged APCOA, Chuckery, easy pickings, Express & Star, fines, Local politics, Mike Bird, New Photos, on street parking, Parking, parking enforcement, parking fines, PCN, penalty notice, Politics, Silly, Tesco Development, TraceyQ, Twitter, Walsall, Walsall Council, Walsall politics, Walsall Wood. Bookmark the permalink. 6 Responses to Ticket to raid? walsall council are an utter disgrace. i do not know how they can say they are working for the people of the borough,whilst taking thier big fat pay cheques home at the end of every month.. I notice thatthe ‘illegal’ car park in Lower Rushall Street is still doing a roaring trade at £3 a day. Funny though, I could have sworn that David Elsworthy, Head of Planning, was reported in the E&S on 5th of January, 2011, as saying that he recommended taking enforcement action to prevent the site being used as a car park. If the idiots in the Civic had done their sums properly those £3 payments would be going into council coffers, but no. 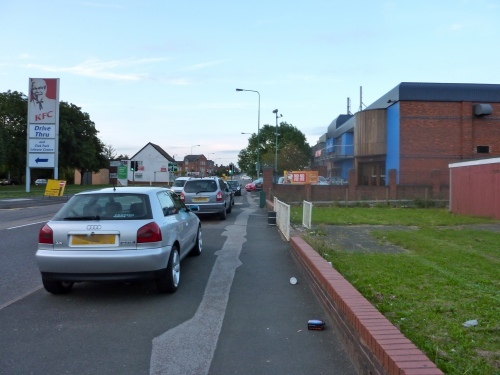 The way Walsall Council treats its residents, visitors and businesses regarding their narrow minded attitude on parking is a disgrace – they should be ashamed of themselves. If our town turns into a ghost town it will be their doing as their parking rules, most which are for no other purpose than revenue collection, it will all be down to them. I have been campaigning for ages against this madness, what they a re doing is blighting the town and as well as wrecking local businesses and the jobs that go with them, they are also destroying the value of the homes of many such as Tracy – who would want to buy a house where the Council makes it almost impossible to park then pounces when you do? Every person who lives in such Council blighted areas should apply for a reduction in their council taxes on the basis Walsall Council, through its inconsiderate actions has devalued their homes. It’s already well on the way Derek. Been shopping there lately? If you want ‘sports’ clothing or a pound shop, and like the sight of ‘To Let’ signs or boarded-up windows you’re well in. As to the parking, while parking slightly over the lines is technically illegal, that case hardly made any difference did it? It didn’t impede traffic or block a view (unlike the car in the picture), so why ticket it? it does indeed seem like there’s deliberate targeting of residents- the people who are paying for the wardens- and wholesale ignoring of more serious problems: the traffic that flows through the bus station, the parking on pavements as detailed above, the misuse of pedestrianised areas, the continual, blatant parking on double yellow lines in areas that restrict traffic flow (I’m thinking High St, Aldridge)……. Stuff that, let’s go for a easy target. Why make a difference when you can pick away at the little things. It would seem a proper residents scheme (as in Forster St) would be the sane answer. Our council is determined to punish its residents, and to close down as much of the town as possible, either though malevolence or stupidity. I mean, who’d have thought opening a huge Tesco with free parking would make people use the car park (and store) there? I loved Mad Mike Bird’s response to Tesco’s free parking too. Instead of reducing or scrapping charges in council car parks (thereby possibly spreading some of the parking around?) he wants Tesco to start charging. Have you noticed the way in which the newly painted ‘red route’ lines are ignored , or circumvented by people parking on the footpath?